Design Process: High Density Schools –a new typology of school in the city. Over 100 new skyscrapers are being added to global city skylines each year. Of these, 76% are in Asia. Whilst the business and residential sectors are driving these developments, with the need for further schools in cities, it’s only a matter of time before educational learning within tall buildings becomes the norm. Alongside the big issues being considered by education systems around the world including: How can technology be harnessed to support learning? What does it mean to be a global citizen in the 21st Century? What skills and experiences will young people need to make the most of their opportunities?, continuing global urbanisation and population growth requires an architectural response that can deliver more school, college and university places on increasingly dense and challenging sites where land is at a premium. Here Helen Taylor explores the future of high density learning. Limited space in both developed and developing economies is encouraging schools to grow upwards. Educationalists and architects are having to work closely together to develop imaginative and visionary solutions. To create vertical environments that not only work as positive, flexible learning spaces but also still create a sense of community within the school and a positive relationship with the surrounding urban fabric and the natural world. The extent of vertical circulation in a multi-storey learning environment requires new ways of considering school organisation, timetabling, effective multipurpose use of space, and access to the outside on multiple levels. The height of a school building is constrained more by practical and pedagogical issues than structural or planning constraints. Parents want to ensure their children are in a safe environment and have access to the same range of learning and social opportunities they would enjoy in a more conventional school environment. Maximising the value of a site takes on a different meaning in a school. The proposed 10-storey SHaW Futures Academy in Bromley, south east London, would be the tallest school of its kind within the UK. 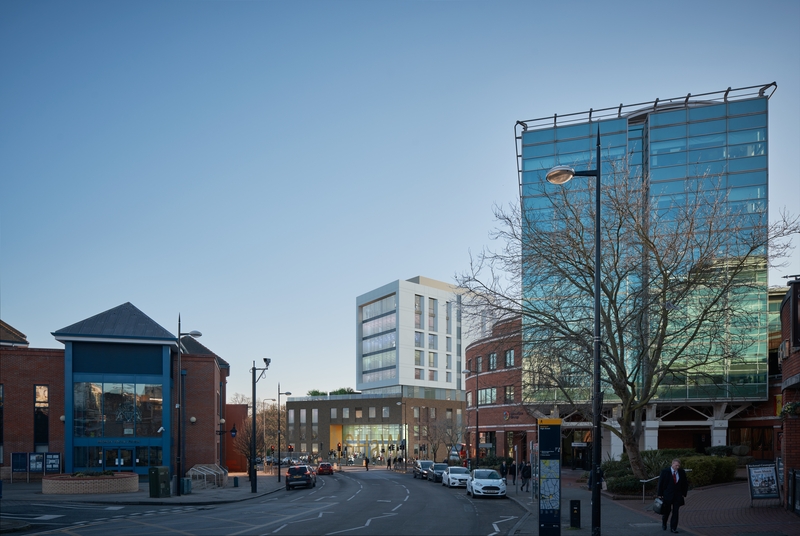 Designed to be a landmark building, part of the wider regeneration of the area, the brief is to provide a centre for Science, Health and Wellbeing excellence, offering 11-19 year olds, unrivalled access to skills and opportunities on their front door step. Precedents around the world for similar schemes are limited. Universities or schools occupying a few floors of a tower do not provide suitable comparisons. Only the recently proposed Parramatta School in Sydney, Australia by Grimshaw Architects provides a suitable comparator in terms of height, organisation and pedagogical strategies. The successful development of SHaW’s innovative design has relied on the commitment of the school trust to a multi-storey environment. However, without operational precedents to assess, the client team had to carry out timetabling exercises to ensure efficiency and flexibility in the circulation and accommodation design to allow for any unanticipated future needs of the school. Design development of SHaW Futures Academy was particularly constrained by site conditions - many of which were invisible: an unbridgeable culvert under the site; height, massing and building line restrictions imposed by Planning Policy; and the site’s position at the junction between the high rise developing commercial and low rise suburban residential development of Bromley centre. Adjacent listed buildings had to be considered sensitively but were less of a restriction than cost, buildability and the aspiration for the school to express its function and “civic” nature. Restrictive site logistics plus programme, environmental and material output specification requirements demanded an innovative elevation strategy. Whilst a “sealed” building is typically avoided by schools, here the scheme demanded it due to air quality and noise issues as well as the unusual height of the school building. A tall school requires significantly greater proportion and area of circulation than a typical three or four storey school so the need to deliver an adequate teaching area without exceeding the total funded area was a critical challenge. To minimise excessive travel distances during the school day the vertical layout effectively creates three stacked schools - one for each Key Stage; each with its own dining and social space, learning resource centre, and external space. Key Stage 3 students (Years 7 and 8 - age 11-13) arrive at the Lower Ground Floor where their dining area creates a social space, linked directly to the external spaces. They take the stairs to their Learning Base on Ground Floor, Level 1 and Level 2 where a series of general classrooms, Science Labs, Music, Activity Studio, Food and Resistant Material spaces allow for the delivery of a broad and balanced curriculum. A Sports Science Lab and Computing Base ensure the younger students can also experience the high quality specialist spaces on offer in the school and see older students learning on a daily basis. Key Stage 4 students (Years 9, 10 and 11- age 13 to 16) arrive by the main entrance at Upper Ground Floor and take the central stairs or lifts to their Hub at Level 3. Levels 4, 5, 6 and 7 contain a range of specialist and general teaching spaces to deliver the three learning pathways on offer. They share some of these spaces with post 16 year old students, allowing collaboration across the phases and for older students to act as role models. Flexible areas for skills development and independent study, as well as the highly specialist spaces for Health, Biomedical and Sports, Computing and Electronics, allow for practice-based education for all learners, developing problem-solving abilities and communication skills. Key Stage 5 students (Years 12 and 13 - age 16 to 19) also arrive via the Upper Ground Floor entrance and take the north core lifts to their social space at Level 8. In the Sixth Form highly specialist pathways will be established with employers focused on Science, Health and Wellbeing. These Key Stage Learning Bases create a sense of identity, community and progression as students move through the school. They also allow for each curriculum area to have a core cluster of learning spaces within the building, enabling them to form a clear identity, showcasing career opportunities, displaying student work and allowing staff to share practice. Circulation creates a comfortable vertical and horizontal flow but also provides opportunities for informal group work and connectivity. In order that students feel safe and secure at all times, staff spaces have been placed for maximum passive supervision and pupil and staff/ disabled toilets are available and evenly distributed on every floor for ease of access. 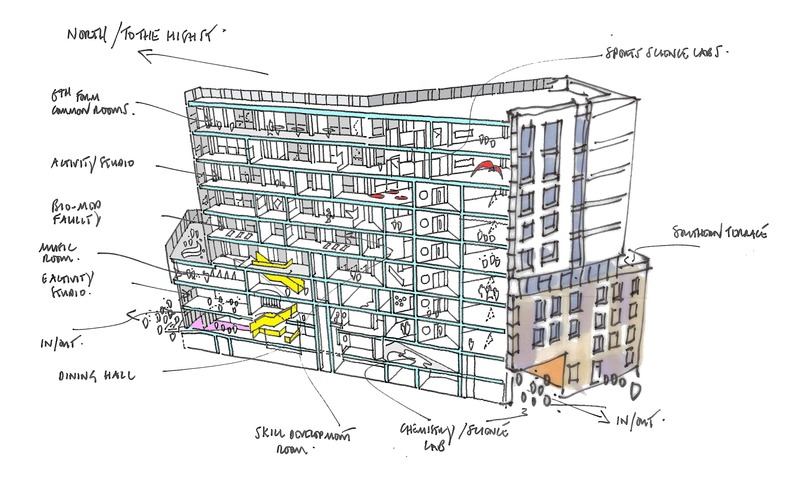 The site constraints necessitated a pragmatic design response that is non-typical for a secondary school design on the lower floors but becomes more rational and recognisable on the upper floors. 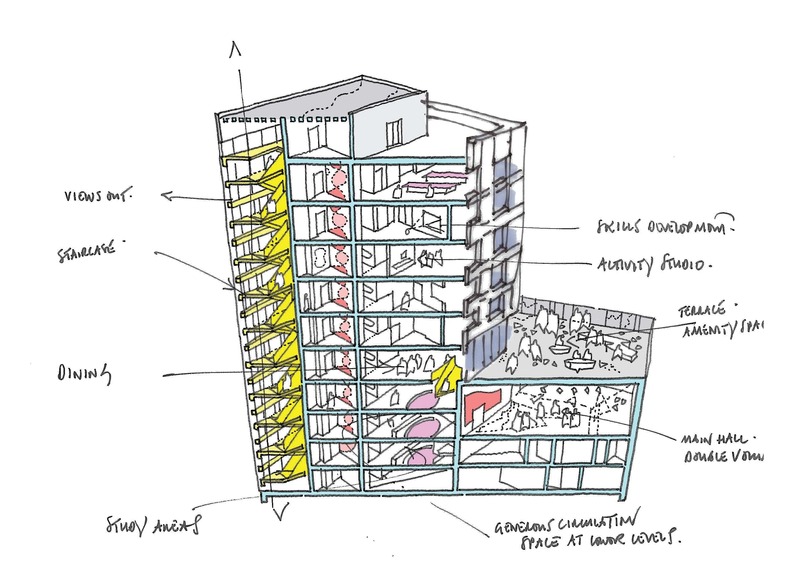 The relatively deep plan “podium” (four storeys from lower ground to level 2) has been used to good effect to accommodate the larger volume spaces such as the main hall and activity studio or fully enclosed spaces such as changing rooms and stores. Teaching spaces have been kept to the perimeter to maintain adequate daylighting standards and internal rooms are limited to circulation, some staff bases and small group rooms where staff and students will spend less lengthy periods. In the upper six storey block (levels 3-8) the narrower building form enables teaching spaces to be placed on either side of the central circulation route and daylighting requirements to be met in both directions. A central void in the slab for an accommodation stair also offers an opportunity to bring borrowed light deep into the heart of the plan. All circulation and social spaces have the benefit of natural daylight and views. Building in flexibility is challenging due to the vertical stacking of accommodation and the need to retain appropriate fire escape provision. However, the use of a concrete frame structure with flat slabs and minimal load-bearing partitions does allow for potential internal re-planning. A variety of room sizes and shapes are provided on every floor to encourage alternative classroom layouts and a natural diversity of teaching spaces. Specialist spaces require flexible use to meet the time-tabling requirements which generates a more standardised Furniture, Fittings and Equipment (FFE) installation that can be used in different ways. This will also allow for the curriculum to develop, and the time-tabling of facilities to start on the lower floors and expand up the building, as the school population grows over time. Key spaces are on show - such as the main entrances from the high street and through the bridge, the café at the entrance, the main hall and science labs. It is visibly at the heart of the neighbourhood - a beacon of learning. These new learning environments may be responding to physical and economic constraints but they offer a fantastic opportunity to integrate and permeate education into the heart of a city, implement and progress new ways of learning, and prepare students for the future.